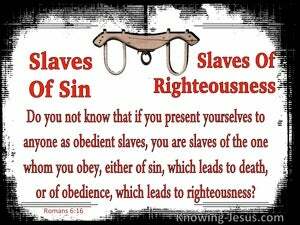 ﻿ Romans 6:16 Do you not know that when you present yourselves to someone as slaves for obedience, you are slaves of the one whom you obey, either of sin resulting in death, or of obedience resulting in righteousness? Do you not know that if you offer yourselves to someone as obedient slaves, you are slaves of that one you obey-either of sin leading to death or of obedience leading to righteousness? 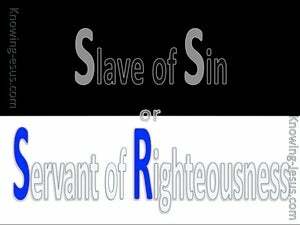 Don't you know that when you offer yourselves to someone as obedient slaves, you are slaves of the one you obey either of sin, which leads to death, or of obedience, which leads to righteousness? Know ye not, that to what ye present yourselves as bondmen for obedience, ye are bondmen to what ye obey, whether of sin for death, or of obedience for righteousness? Know ye not, that to whom ye present yourselves as'servants unto obedience, his servants ye are whom ye obey; whether of sin unto death, or of obedience unto righteousness? Do you not know that if you continually surrender yourselves to anyone to do his will, you are the slaves of him whom you obey, whether that be to sin, which leads to death, or to obedience which leads to righteousness (right doing and right standing with God)? Do you not know that you are the slaves of whoever you offer your obedience to? 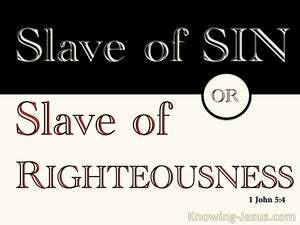 If you obey [the desire to] sin, it leads to [spiritual] death; or if you obey [God] it leads to righteousness. Know you not, that to whom you present yourselves as servants to obey, his servants you are whom you obey, whether of sin that leads to death, or of obedience that leads to righteousness? Are you not conscious that you are the servants of him to whom you give yourselves to do his desire? if to sin, the end being death, or if to do the desire of God, the end being righteousness. Do you not know that if you yield yourselves to any one to obey as slaves, you are slaves of the one whom you obey, whether of sin, which leads to death, or of obedience, which leads to righteousness? by no means. know ye not, that to whom ye subject your selves vassals at command, his vassals you are whom you thus obey; the vassals either of sin to destruction, or of obedience to justification? Know ye not that to whom ye yield yourselves bondmen for obedience, ye are bondmen to him whom ye obey, whether of sin unto death, or of obedience unto righteousness? Do you not know, that to whom you present yourselves servants unto obedience, ye are servants to whom you obey; whether of sin unto death, or obedience unto righteousness? Do you not know that when you submit to being someone's slaves, and obeying him, you are the slaves of the one whom you obey, whether your slavery is to sin, and leads to death, or is to obedience, and leads to uprightness? Know ye not, that to whom ye present yourselves servants to obey, his servants ye are whom ye obey? Whether of sin unto death, or of obedience unto righteousness? Or know ye not that to whom ye present yourselves slaves to obey, his slaves ye are to whom ye obey, whether of sin unto death or of the obedience unto righteousness? Know ye not, that to whom ye present yourselves servants for obedience, ye are servants to whom ye listen; either of sin to death, or of obedience to justice? Know you not, that to whom you yield yourselves servants to obey, his servants you are to whom you obey; whether of sin unto death, or of obedience unto righteousness? Do you not know that to whomever you present yourselves [as] slaves for obedience, you are slaves to whomever you obey, whether sin, [leading] to death, or obedience, [leading] to righteousness? Do you not know that to whom you yield yourselves as slaves for obedience, you are slaves to him whom you obey; whether it is of sin to death, or of obedience to righteousness. Remember ye not how that to whomsoever ye commit yourselves as servants to obey, his servants ye are to whom ye obey: whether it be of sin unto death, or of obedience unto righteousness? Do you not know you are the servants of the master you obey, of the master to whom you yield yourselves obedient, whether it is Sin, whose service ends in death, or Obedience, whose service ends in righteousness? Do you not know that when you surrender yourselves as slaves to any one to obey him, you are his slaves whom you obey; whether it be sin, whose end is death, or obedience, whose end is righteousness? 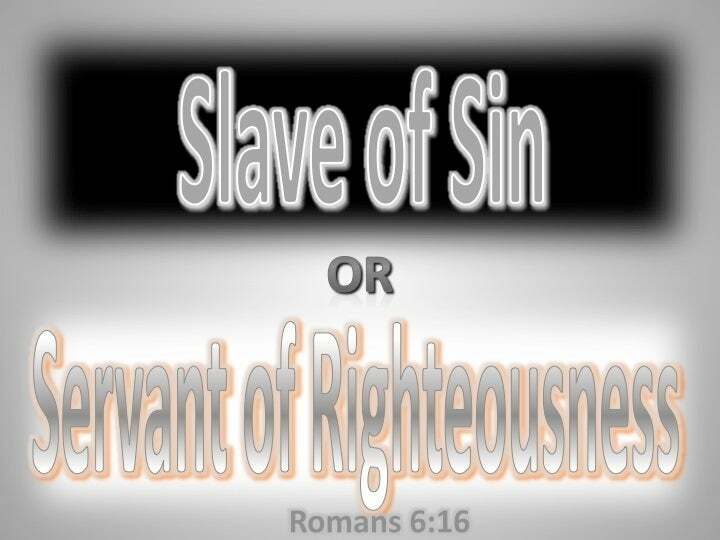 Do you not know that if you present yourselves as obedient slaves, you are slaves of the one you obey, either of sin resulting in death, or obedience resulting in righteousness? Do you not know that to whom you present yourselves as servants to obedience, his servants you are whom you obey; whether of sin to death, or of obedience to righteousness? Know ye not, that whomever ye choose to obey as a master, his bondmen ye are, whether of sin whose fruit is death, or of obedience whose fruit is righteousness? Know you not that to whom you present yourselves servants for obedience, his servants you are whom you obey, whether of sin in death or of obedience in righteousness? Know ye not that, unto whom ye are presenting yourselves as servants for obedience, servants ye are unto him unto whom ye are obedient, whether of sin unto death or of obedience unto righteousness? Do ye not know, that to whomsoever ye present yourselves servants to obey, ye are his servants to whom ye obey; if of sin unto death, or of obedience, unto righteousness? Surely you know that, when you offer yourselves as servants, to obey any one, you are the servants of the person whom you obey, whether the service be that of Sin which leads to Death, or that of Duty which leads to Righteousness. Know ye not, that to whom ye yield yourselves servants in obedience, his servants ye are whom ye obey; whether of sin to death, or of obedience to righteousness? Do you not know that when you habitually offer yourselves to anyone for obedience to him, you are slaves to that one whom you are in the habit of obeying, whether it is the slavery to sin whose end is death or to obedience whose end is right-doing? Don't you know that to whom you present yourselves as servants to obedience, his servants you are whom you obey; whether of sin to death, or of obedience to righteousness? Know ye not that to whom ye present yourselves as slaves for obedience, his slaves ye are whom ye obey, whether of sin unto death, or obedience unto righteousness? God forbid! Know ye not, that to whom ye present yourselves servants to obedience, his servants ye are whom ye obey? 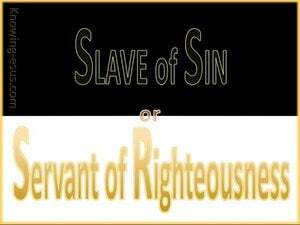 either of sin unto death, or of obedience unto righteousness? have ye not known that to whom ye present yourselves servants for obedience, servants ye are to him to whom ye obey, whether of sin to death, or of obedience to righteousness? Jesus answered them, "Truly, truly, I say to you, everyone who commits sin is the slave of sin. promising them freedom while they themselves are slaves of corruption; for by what a man is overcome, by this he is enslaved.